These two companies are simplifying multiple jobs by combining their respective talents and delivering the solution from a single provider. Airbus Aerial and DroneBase have created a partnership that delivers the first multi-source data service solution for aerial imagery and data from a single provider. This effort enables companies that have previously used a variety of separate sources for their data and imagery insights to now use a single, global service provider. Airbus Aerial, an Airbus aerial services business with bases in the U.S., Europe and Asia Pacific, provide software and aerospace technology from across the globe to offer actionable data and analysis of information provided by drones, satellites, high altitude aircraft and other sources. Likewise, with over 100,000 commercial missions flown in over 70 countries, DroneBase reports to have the largest pilot network with tens of thousands of highly skilled professional pilots. DroneBase can provide aerial imagery and data of any U.S. address within 48-72 hours, depending on airspace. 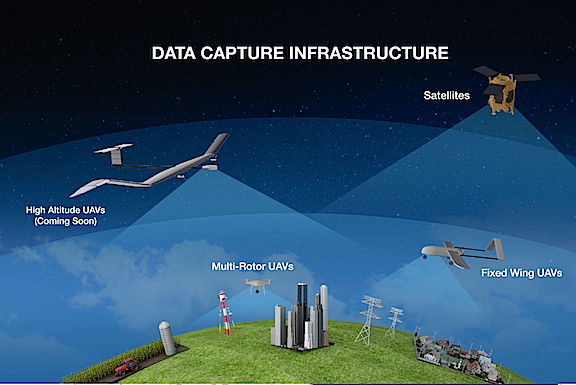 Combine these two service providers and now this new partnership enables companies in various markets to work with one global source to provide data from drones, manned aircraft, or satellites. For example, insurers looking to quickly respond to natural disasters can now leverage satellites to view entire cities at high resolution and analyze the damage levels within 12-24 hours to better support their customers, while drones also view specific areas where more attention is needed. Jesse Kallman, President of Airbus Aerial said they are very excited to announce this historic partnership that leverages Aerial’s significant investment in the automation of satellite, manned aviation, and drone data capture and analysis with the DroneBase API and their global pilot network. Companies new to this sort of data now have a trusted partner to help them understand which types of data and analysis make the most sense for them and can help them solve their toughest challenges. Additionally, major utilities, rail, and energy companies overseeing vast networks of infrastructure can capitalize on routine monitoring from satellites to track vegetation encroachment or easement violations. When issues are detected, drones can better classify the issues and determine the most accurate solution. Dan Burton, CEO and Co-founder of DroneBase added that Airbus Aerial has built upon Airbus Intelligence’s history of being the premier satellite imaging service in the world with unrivalled access to the most comprehensive range of commercial Earth observation data available, covering any point on Earth at least once a day. With the addition of DroneBase’s drone operations expertise, together they can provide a true one-stop shop for companies to acquire all levels of aerial data and insight for various industries. With offices in Atlanta, Munich, and Singapore, Airbus Aerial also helps its customers to appropriately scale the use of aerial data and analysis around the world. They can accomplish this by using their cloud-based platform relying on OneAtlas, the Airbus Intelligence satellite basemap that allows customers to streamline asset viewing, order new data from any source and process all collected information using the best geospatial tools — all in one place.